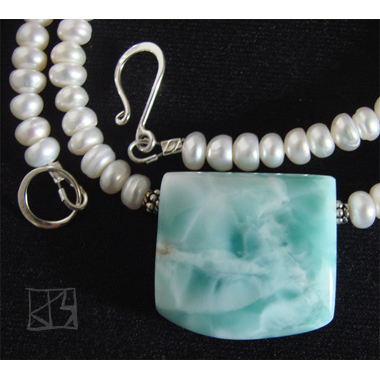 Larimar is a rare form of Pectolite that occurs only in the Dominican Republic, discovered only about 40 years ago. Although the color is created by volcanic activities, it seems to exquisitely embody the serene beauty of the surrounding sea and sky and thought to have calming effects on body and soul. Large clear specimens of this beautiful stone are becoming rare in a depleting market. This is from vintage stock -- cut in the 1980s less than 10 years after the vein was discovered -- and so a truly remarkable piece. 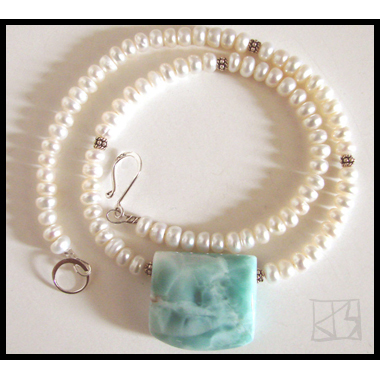 Centered on a strand of natural white pearls and a few highlights of sterling silver Bali beads.